Just a couple of days before Christmas! Are you panic-shopping? I know I am! That's why I'm inserting some Christmas Gift Ideas every now and then because I know how hard it is to think of simple yet meaningful gifts! Gift-giving doesn't have to be complicated, you only need to understand the "wants and likes" of the recipient and the shopping will come easier! Basilur carries the Lion Logo - Symbol of quality teas produced and packed in Sri Lanka. The name "Ceylon Tea' and the famous lion logo that goes with it indicates that the tea grown, manufactured and packed entirely in Sri Lanka conforming to the strict quality standard laid down and administered by the Sri Lanka Tea Board. Holiday in a Cup - Spread holiday cheer with a refreshing cup of green tea that is exceptionally blended with the sweet, subtle flavours of berries and light base of flower petals. Teabook Collection - Choose between Specialty Classic, Oriental Collection, Collection No. 1 , Magic Fruits and Bouquet. Tea's The Season (Magic Fruits Loose Leaves) - Choose between Strawberry and Kiwi, Mango and Pineapple or Lemon and Lime. Give Flavor on Christmas Day (Fruit Infusions Loose Leaves) - Choose between Indian Summer, Strawberry and Raspberry or Caribbean Cocktail. Non-tea lovers can enjoy Fruits in Bloom! I have always loved sending Fruit Bouquet to mom and dad because they can definitely enjoy these better than regular flowers! You know how parents are about spending money on Flowers you can't eat? Now they can! There are several types of fruit arrangements to choose from. Feel free to visit www.fib.com.ph. 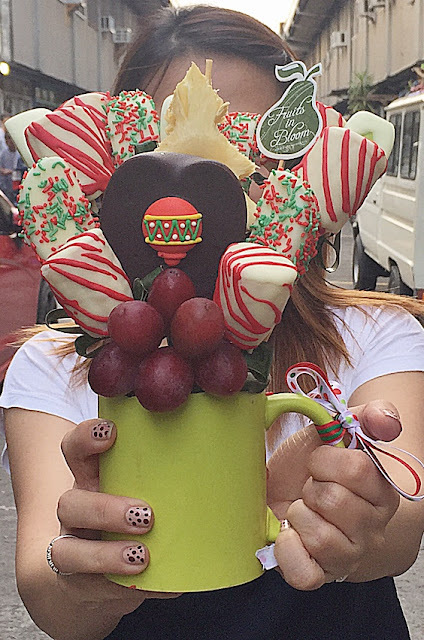 What other Christmas Gift Recommendations would you gift to fruit lovers out there? Well, aside from baskets of fruits? hehehe I'd love to hear from you!